The Beagle arrived in the Galápagos in the autumn of 1835, having been under sail for nearly four years. After inspecting and mapping the island of San Cristóbal for a week, the expedition anchored in the bay of Floreana on September 24th. Floreana was one of the minor islands, but it offered a supply of fresh water which made it the main port of the archipelago. On the highland plateau, a few hours' walk through dense jungle, was the settlement of Asilo de la Paz with roughly 200 inhabitants and the governor's residence. But after he came home, Darwin started cataloguing his collection of mockingbirds. And gradually, he realised that Lawson was right: The birds also varied slightly from island to island. And this was more than a little fun fact: They all looked superficially like the species found on the South American mainland ... except that their beaks were seemingly adapted to fit a certain diet: Those who ate nuts had harder, stronger beaks like nutcrackers, and those who ate bugs had longer, more narrow beaks that could be used to pick bugs from behind the bark of the trees. Apart from that, they were identical and would have been deemed the same species. Darwin was not originally a zoologist. Following his father's advice he became a priest, but he also studied geology on his own initiative, and this was his primary task during the Beagle expedition. 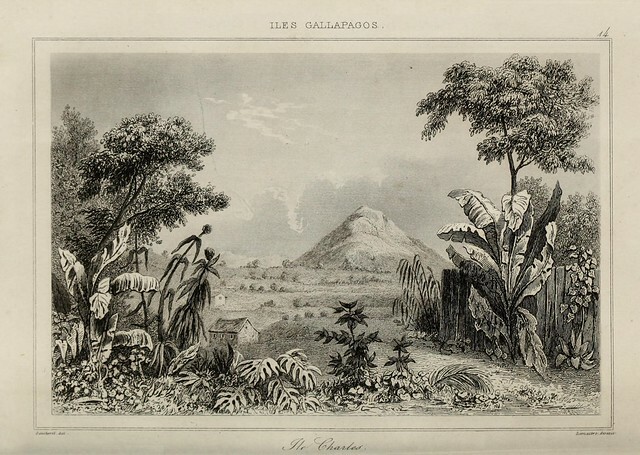 He knew that the Galápagos Islands were of volcanic origin, and much younger than the American mainland. In spite of this, the islands harboured a large quantity of species like the mockingbirds, obviously fine-tuned to survive in this young environment. This made him question the generally accepted idea that all species ‒ even mankind ‒ were created at the same time as Earth itself. In November 1859, 24 years after his visit to Galápagos, Darwin presented his theory in the groundbreaking work "On the Origin of Species by Means of Natural Selection." And the world was never the same. But Lack couldn't tell us exactly who this man was. The Vice Governor who happened to be in the right place at the right time, and unwittingly sparked Darwin's chain of thought, has long been enveloped in a shroud of mystery. There are no traces of him in British or Jamaican registries. No censuses, birth or navy records mention him at all. In hindsight, the reason for this is simple: Nicholas Oliver Lawson was no Englishman at all. He was from a small farm on a small island in the fjords of Western Norway. 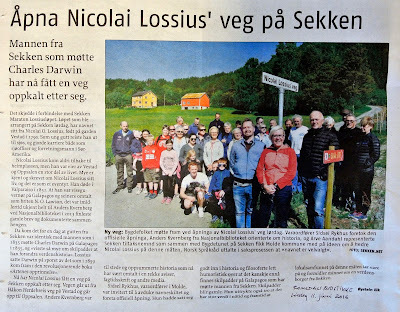 Nicolai Olaus Lossius was born on Vestad farm on November 23rd 1790, and baptised in the medieval Veøy church. He was the first son of infantry captain Christoffer Lorentz Lossius and his wife Anna Katatrina Sigholt. 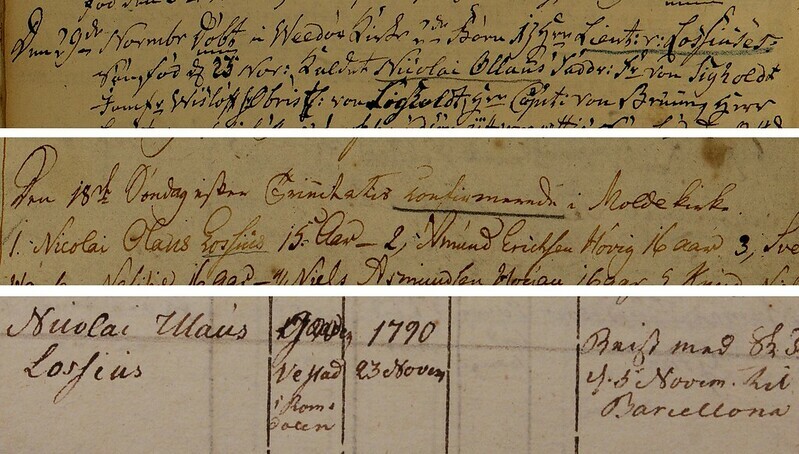 Nicolai Lossius' baptism record of 29 November 1790; confirmation record of 13 October 1805, and naval draft list of 1806. They sailed all winter and on the way home in spring, captain Dahl fell over board and drowned. But this clearly didn't scare the adventurous, sixteen year old boy. Shortly after returning home he left again, this time on a Scottish ship going to England. What was probably meant to be a short trip, eventually changed Nicolai's life ‒ and the world ‒ forever. The captain treated him poorly and cheated him out of his pay. When they stopped over in Liverpool, Nicolai left the ship. Or perhaps he was fired, it's impossible to tell. But going back home with captain Adam Morrison was apparently not an option. We can imagine a penniless teenager walking the docks of Liverpool, the busiest port in the world at the time, not speaking the language and trying to find a ship bound home. He would soon realise that no ships were going to Norway. International politics had come in the way. After the British Navy attacked Copenhagen in September 1807, prince regent Frederik of Denmark forged an alliance with Britain's arch enemy, emperor Napoleon. The British responded with a massive embargo of the North Sea. For years, not a single trading ship sailed between England and Norway, causing a famine that would be remembered for generations. At age 17, Nicolai signed on a ship going to Brazil. He would never see his family again. Nicolai Olaus Lossius could easily have become just another cabin boy who left home, leaving nothing but a name in the baptism records. But he lived to be an old man, and eventually he wrote several letters home from the other side of the world. And by a string of coincidences, extremely improbable as it is, the stories he told in those letters are preserved today. In the age of sail, sending international mail was no easy matter. A sealed note would be left with some ship going in roughly the right direction, and then luck more than anything would decide the outcome. This was before steam ships, before the rail road and the telegraph, and it could well take a year or more before the sender, maybe, received a reply. The preserved letters from Nicolai are full of references to other letters that never made it across the oceans. Nine of these letters are printed (as a 15-page footnote!) in his niece Wilhemline Brandt's genealogy book "Stamtavle over Familjerne Lossius og Brandt". The originals are probably lost, but a tenth and eleventh original letter are preserved among Brandt's personal files in the National Archives in Oslo. These letters give us an insight into Nicolai's life and make up the main sources of this article. Nicolai was an adventurer, but he also in time became a pragmatic businessman. The letters are sober and factual in nature, and what can be compared to contemporary sources is mainly correct. But note the word "mainly!" Both the letters and the secondary literature are clearly vague or contradictory on certain points. The letters are written by an aging man, reminiscing about his youth. One's memory is a vague thing. In time, Nicolai forgot his native tongue and wrote most of his letters home in a self-taught English, often sprinkled with Spanish idioms and and business jargon that would be quite cryptical to a reciever in Norway. Brandt (who, to be honest, had a quite messy handwriting) then translated his letters and delivered her manuscript to a commissioned typesetter who produced the printing plates for her book. During this long journey from a naval battle in the Pacific to a print house in Bergen long since, some details have clearly been obscured. The South American sources are also at times self-contradictory or incomplete. I have chosen the information that give most sense in the total picture, although I fully suspect it must be corrected if new information comes to light. All in all, the story of Nicolai Olaus Lossius is – just like the story of the mysterious Vice Governor Nicholas Lawson – obscured by the passing of time, so that we may today see what events have passed, but not necessarily where, when and in what order. The loose fragments we do have, however, give an account of a dramatic life in a very dramatic age. After he left the farm, the family heard nothing from Nicolai for years. When the naval draft lists were updated at year's end in 1807, the remark "Presumably in England" was added to his name. Given the state of war with England, his father the army captain must have gone from eagerly awaiting any British ship perhaps carrying his son home, to participating in erecting a battery of cannons for the specific purpose of sinking any British ship spotted in the fjord. We can assume he carried out this duty with conflicted feelings. The next three years we know nothing about, but in 1810 Nicolai was sailing the Mediterranean. His ship was captured by pirates, and the crew was brought ashore in Tunis. For hundreds of years, Algerian, Tunisian and Tripolitanian pirates were marauding the coasts of North Africa – colloquially called "the Barbary". Normally, the ships were looted and the crew sold as slaves. Some were released for ransom, but most (among them quite a few Scandinavians) ended up as slaves performing hard manual labour for the rest of their lives. As I was freed, I wanted to go where my freedom could be maintained, and North America seemed to me the only land of freedom on Earth. (...) I had already seen too much of the wretched despotism of Europe. He arrived in Philadelphia later that year, and found a job as a sailor. He took part in the first American-Chinese trade routes, and the following year he enrolled in the US Navy and became captain of a corvet. From what I have been able to ascertain, he was the first person from Romsdal we know of with a US citizenship, perhaps even the first Norwegian. The massive wave of emigration from Norway to the United States is officially reckoned as starting with a small group of Quakers leaving Stavanger 14 years later. For Nicolai (who now called himself Nicholas Oliver Lawson) the war ended in 1813 when he was captured again, this time by the British off Cádiz. This time around, captivity was apparently not as harsh as in Africa: Nicolai escaped the same night and travelled to New Brunswick, Canada, where he began trading in fish and timber and made good money for a while. But his fortune must have been based on risky gambles: After one failed shipment to England, he went completely bankrupt. So, in 1816 he was broke again. His former employer, the United States Navy, was apparently not an option. The personnel records of this time are not preserved, but having failed to report back after escaping captivity, he was probably considered a deserter – This may have been why he settled in Canada. However, these were uneasy times and for a veteran there were several wars to choose between. In Europe, the Napoleonic Wars and the Iberian War had reduced Spain's military capacity. The crown was no longer able to hold the vast colonies in South America, where republics and revolutionary armies were established en masse. And so, like thousands of other soldiers of fortune down on their luck, Nicolai travelled south. Chile with its sprawling coastline of islets and steep fjords, was the most rescent breakaway republic in need of sailors. 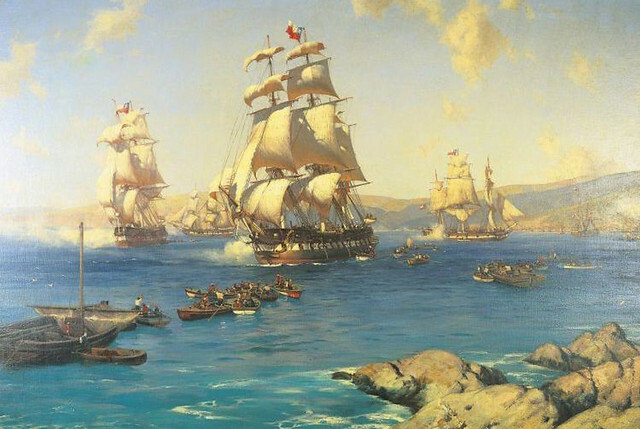 In October 1818, he signed on with the Chilean Navy based in the port of Valparaíso. The fleet consisted of 17 ships, mainly armed trading vessels, and their mission was to evict the mighty Spanish armada. In his letters home, Nicolai detailed his career in the Chilean Navy: He started as pilot of the 44-cannon frigate "Lautaro", and he advanced to become lieutenant under Chile's revolutionary hero, Scottish-born vice admiral Thomas Cochrane. On the night of February 4th 1820 the fledgling Chilean Navy captured the fortified port city of Valdivia and turned the tide of the war. "1. Squadron raises anchor, 10 October 1818." Oil painting by Thomoas Somerscales. Ten days later, Nicolai Lossius was appointed pilot of the ship on the far left, the "Lautaro." As the rebels stormed the Spanish stronghold, Nicolai captured a wounded enemy captain. According to Nicolai's letters the captain, on the verge of death, lauded him as a worthy opponent and promised him his daughter's hand in marriage. This was no small gesture: The daughter, Rosario, belonged to the country's upper class, the niece of two generals and the former governor of Valparaíso. Such a union carried with it a considerable social position, and a promising future for Nicolai in this strange new country. After careful consideration of these sources, I must admit that the choice of what to believe stands between an account from an aging sailor's memory and contradictory written sources coming out of a chaotic time of civil war. This most dramatic part of this story remains shrouded in mystery. Until the Panama Canal opened in 1914, Valparaíso was a major port on the trading route around Cape Horn. The city had a vibrant international population, with large groups of British, Americans, Irishmen, Italians, Germans and even Scandinavians, in addition to Spaniards, Spanish Chileans and American natives. Due to his service under Cochrane and his ties to one of the city's prominent families, Nicolai became a part of the upper class. He left the navy service, and spent the next years as a ship owner and freight captain, making profitable trips to the South Seas, China and India. And in between his journeys he made several stays on a desolate archipelago off the South American mainland, yet unclaimed by any nation, inhabited only by its weird species of reptiles and birds – the Galápagos Islands. The settlement at Floreana at the time Darwin visited the islands. The colonists introduced more livestock and crops, in addition to the ready supply of tortoise meat. 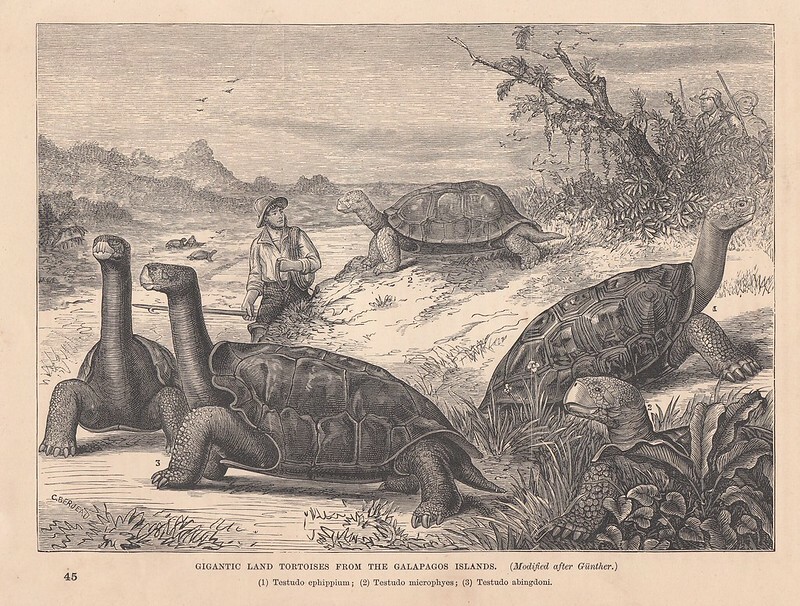 According to Nicolai, the tortoises were so large that two days' hunting could feed the colonists for the rest of the week. The shells were used as containers, flower pots and crockery. The settlement consisted of roughly 200 people, sharing 80 simple huts. The Englishman was probably Nicolai. Darwin also perceived him as English, and other sources mention him as an American (or, mistakenly, Jamaican). In formal papers he called himself Norwegian, but most people he interacted with in his daily life had probably never heard of Norway. His superior, José Villamil, was born in a French-Ecuadorean family in New Orleans, which at the time belonged to Spain. When such citizens of the world are asked where they are from, they would not necessarily think of their geographic place of birth. Nicolai also held a United States citizenship, and "English" could, in the widest sense of the word, be perceived as meaning "English-speaking and white". The French captain Abel du Petit-Thouars also mentioned Nicolai in his narration of a visit to the islands in 1838. He described him as knowledgeable and "energetic", able to converse in detail about the various ocean currents, winds, soils and climates of the islands. Captain FitzRoy of The Beagle also mentions him specifically as a repertoire of information on the islands' various resources, medicinal plants, hunting grounds and future prospects. And, of course, animals. In 1835, political upheavals in Ecuador forced Villamil to visit the mainland and defend the continued support of the colony. He stayed for nearly a year, and left Nicolai to care for the little island society. In September that very year, The Beagle anchored in the bay. Nicolai was in the harbour to greet a regular customer, an American whaling ship, when captain FitzRoy and Charles Darwin accidentally met him. They were invited to the settlement and served a grand dinner, along with one of Nicolai's speeches on the flora and fauna of the islands. I have two wounds in my head, two in the left arm and shoulder, and still I enjoy good health. But you should also note that I have never had more than one single fit of illness in my life, and that was in 1835 when I commanded the colony of Florianna for the government of Ecuador. The letter is signed by "N. O. Lawson." 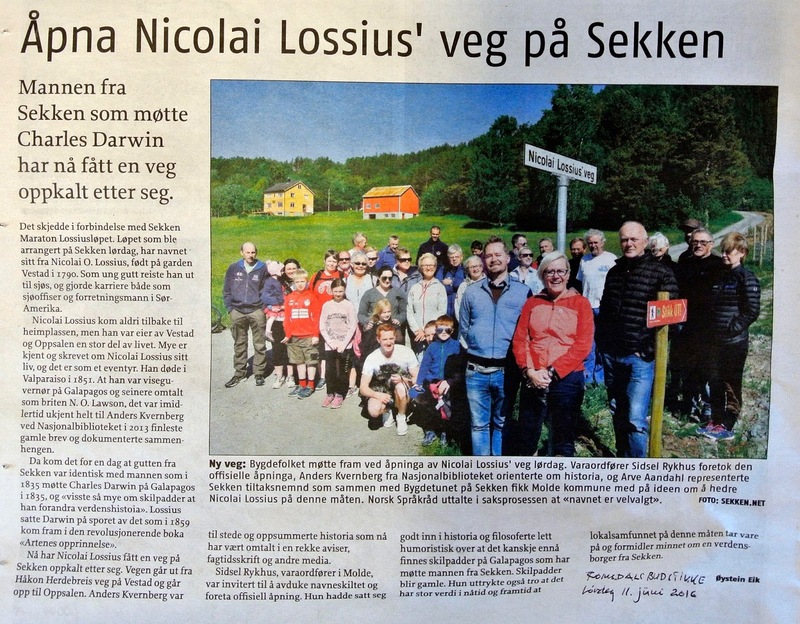 The time and place he gives for his only fit of illness, is the singular proof that Mr. Nicholas O. Lawson, as mentioned by Charles Darwin, is identical to Nicolai Olaus Lossius from Vestad on Sekken Island in Norway. The man who knew his tortoises so well that he changed the course of history – without ever knowing it. After a political shift on the mainland in 1837, supplies were cut off and General Villamil left Floreana for good. The settlement continued, but the population decreased as many of the convicts, their crimes now forgotten, dared to return to the mainland. And if Villamil was a tyrant, his successor was leagues worse: José Williams, his brutal rule aided by a pack of attack dogs, was later immortalised as "The Dog King" in Herman Melville's collection of short stories "Las Encantadas." We don't know how long Nicolai stayed on Floreana. According to some sources, he brought a group of settlers to the neighbouring island of Santa Cruz and founded a colony where he acted as mayor for seven years. This must have been somebody else, or perhaps for a shorter period of time. Because two years later, in 1839, his wife gave birth to a daughter in Valparaíso. She was named Ana Rita, after Nicolai's mother in Norway, and he became a family man. His letters show that he ceased his travels and turned to ship building. On 22 April 1843, Nicolai was called to a meeting with the British consul in Valparaíso. They had recieved a request for him from his nephew, Christoffer Lossius Brandt. The British consul informed Nicolai of the reason his nephew had tried to get in touch: One and a half year earlier, Nicolai's mother had passed away. The family had not heard from him in years, but they knew he was somewhere in Chile. Twenty years prior, he had corresponded briefly with his father, who had fallen ill and placed an ad in a Norwegian newspaper seeking new about his son – with a warning that he would be considered legally dead unless he was heard from within the traditional period of one year and one day. Perhaps some Norwegian sailors had stopped by Chile and later read the ad, because 355 days after the ad ran, Nicolai received an unexpected letter from his father addressed to him in Valparíso. They corresponded for a while, but only the first letter is preserved today. In the probate documents filed after his mother's death, Nicolai is described as "absent in South America." His part of the inheritance was considerable: 1,193 Norwegian dollars and 53 shillings, a very large sum at the time. Naturally, it was vital to ascertain whether or not he was still alive somewhere. 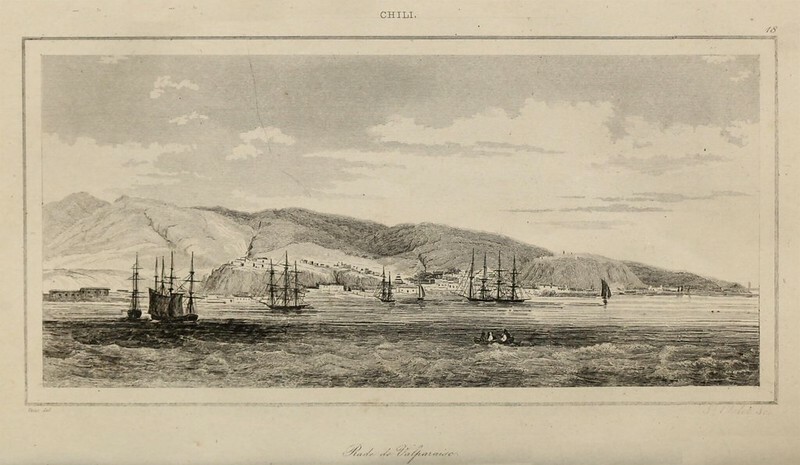 The port of Valparaíso in the 1830s. His nephew Christoffer worked at a German trading company, and apparently one of the privileges were access to a more dependable postal service than what his parents-in-law at the farm had been able to organise. Christoffer had also corresponded with his father in Brazil, and must have known a way around the eccentrities of South American postal services. Through the British consul in Valparaíso, Christoffer was able to confirm that Nicolai was alive. He also got his address. I have often in past times written to my family, but without recieving replies I have given it up. But experiencing now that they all still care about my well being, has relieved my heart of a heavy load. I am blessed with the best wife one could have, and a fair little daughter and I live in the most beautiful country in the Universe. Unfortunately, his little daughter passed away in June 1847, only eight years old. After this, Nicolai at times seems homesick: He would invite Norwegian sailors to his home, and in his letters he continuously asked for books and paintings from Norway, which he had framed and hung on the wall. In his last letter, dated December 1849, he mentions that one of his nephew's friends had stopped by on his way to California. He says that his wife appreciated the guests, and he discusses the favourable price of sending timbers to San Francisco, a city booming from the California gold rush. 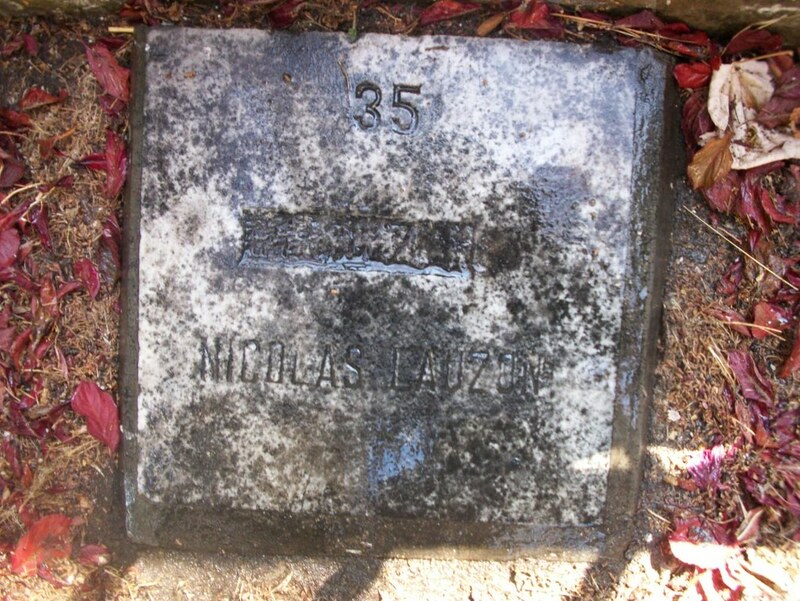 On March 1 1851, Nicholas Oliver Lawson died in Valparaíso from a typhoid fever. Eight weeks later, his widow married a ship captain from Trondheim, Norway. Another eight years would pass before Charles Darwin published his theory, and even longer until his private notebooks became the subject of detailed research and the name "Lawson" appeared, naming a mysterious character he met on the desolate Pacific island of Floreana. Nicolas Lawson's grave in Valparaíso, Chile, photographed in 2014. Some years after Niolai left the islands, the tortoises on Floreana became extinct from over-explotation. Later, Darwin's mockingbirds were also hunted to extinction. (Ironically, due to his making them famous and thus coveted by European zoological museums! ) In 1847 Floreana was turned into a dedicated penal colony. Today the island has a population of about one hundred, about half are stationed on an Ecuadorean army base. In 1925, roughly a hundred years after Nicolai began exploring the archipelago, a group of twenty Norwegian settlers from Sandefjord arrived on Florena to make a living from farming and whaling. Norwegian newspapers had praised the plenty of the islands, and during the next years four new expeditions arrived. At one time 150 Norwegians lived in the Galápagos, making out nearly a third of the islands' population. But they soon realised the stories were exaggerated, and they were not prepared for the alien tropic farming. Most returned home or settled on the mainland. In 1996, the last Norwegian-born inhabitant of the Galápagos Islands passed away. A handful of Norwegian family names still live on on the islands. These adventurers set sail from a poverty-ridden arctic Norway, hoping to find a future in the most exotic place imaginable: A tropical island straddling the Equator. If we could travel in time and tell them that they walked in the footsteps of a countryman, they probably would not believe it. Nicolai adapted to his environment, just like the tortoises, and as such he helped Charles Darwin take his first step towards changing the world. In June 2016, the road passing Nicolai's birthplace was named in his honour. FitzRoy, Robert: Narrative of The Surveying Voyages of His Majesty's Ships The Adventure And Beagle Between The Years 1826 And 1836, etc. Colburn. London, 1839. Volume 2, p. 489. Keynes, Richard D. (ed. ): Charles Darwin's Zoology Notes & Specimen Lists from HMS Beagle. Cambridge University Press. Cambridge, 2000, p. 291. Darwin, Charles R.: Journal of Researches Into The Natural History And Geology of The Countries Visited During The Voyage of H.M.S. Beagle Round The World, etc. 2. ed. Murray. London, 1845 p. 393‒394. Sulloway, Frank: Darwin's Conversion: The Beagle Voyage And Its Aftermath. (Journal of the History of Biology no. 15, 1982.) p. 344. Herbert, Sandra: Charles Darwin, Geologist. Cornell University Press. Ithaca, 2005. p. 314. Lack, David: Mr. Lawson of Charles. (American Scientist no. 1, 1963) p. 13. Brandt, Wilhelmine: Stamtavle over Familjerne Lossius og Brandt med flere i samme inngiftede Slegter. Gelmuyden. Bergen, 1863. p. 15-27.
de Seve, Niels: Molde bys historie, bind 1: Før året 1838. 2. ed. Molde Kommune. Molde, 1992. p. 367. Beutlich, F.: Norges Sjøvæbning 1750-1809. Aschehoug. Oslo, 1935. p. 232. Guarda, G.: La Toma de Valdivia. Zig Zag. Santiago, 1970. p. 105; also Guarda, G. Nueva historia de Valdivia. Universidad Católica de Chile. Santiago, 2001. p. 458. Gormaz, Guillermo de la Cuadra: Familias Chilenas. Zamorao y Capertán. Santiago, 1982. p. 19; also Arana, Diego Barros: Historia general de Chile. Editorial Universitaria. Santiago, 2000. p. 393. Guarda, Gabriel: La Sociedad en Chile Austral antes de la colonización alemana 1645‒1850. 2. ed. Universidad Católica de Chile. Santiago, 2006. p. 607. Letter dated 7 January 2013, from the Archivo Histórico Arzobispado de Santiago to the author, referring Parish Record no. 2 of Parroquia Nuestra Señora del Rosario de Valdivia, folio 96. Grant, Thalia K. & Estes, Gregory B.: Darwin in Galapagos: Footsteps to A New World. Princeton University Press. Princeton, . p. 112.
de Petit-Thouars, Abel: Voyage autour du Monde sur la frégate La Vénus pendant les années 1836‒1839. Volume 2. Gides. Paris, 1841. p. 309. La marina ecuatoriana en la historia de Galápagos. Armada, Dirección General de Intereses Máritimos. Quito, 2005. p. 25; also Grant & Estes, p. 116.
de Saint-Vincent, B. & Lacroix, F.: Iles Diverses de trois océans et régions circumpolaires. Firmin Didot Frères. Paris, 1840. p. 172. Coulter, John: Adventures in The Pacific With Observations on The Natural Productions, Manners And Customs of The Natives of The Various Islands, etc. Curry, Jun & Co. Dublin, 1845. p. 54‒58. Warriner, Francis: Cruise of The United States Frigate Potomac Round The World, During The Years 1831‒34. Leavitt, Lord & Co. New York, 1835. p. 321. Grant & Estes, s. 115. Darwin's diary CUL-DAR 158, p. 13. Sulloway, Frank: Darwin's Conversion: The Beagle Voyage And Its Aftermath. (Journal of the History of Biology no. 15, 1982.) Footnote 27, p. 342‒343. Gormaz, F. V.: Algunos naufrajios ocurridos en las costas chilenas desde su descubrimiento hasta nuestros dias. Elzeviriana. Santiago, 1901. p. 167. Guarda, G. El servicio de las cuidades de Valdivia y Osorno 1770‒1820. (Historia no. 15, 1980.) Universidad Católica de Chile, Instituto de Historia. p. 87. Guarda, G.: La economia de Chile Austral antes de la colonización alemana, 1645‒1850. Universidad Austral de Chile. Valdivia, 1973. p. 56. Grant & Estes, s. 131. Holten, B, Sterll, M., Fjeldså, J.: Den forsvundne maler: P. W. Lund og P. A. Brandt i Brasilien. Museum Tusculanums forlag. København, 2004. p. 19. Den Norske Rigstidende, 8, 11 and 15 February 1822. Romsdal sorenskriveri, Skifteutlodningsprotokoll 3A 18, 1840‒1843, folio 279 a.
Cuenta de los ingresos i gastos que tuvo la República de Chile en el año de 1850. Progreso. Santiago, 1854. s. 118. Sepultura de Nicolás Lanzón. Ubicada en pasillo, en el Cementerio No. 1 de Valparaíso. Steadman, David W.: Holocene Vertebrate Fossils from Isla Floreana, Galápagos. (Smithsonian Contributions to Zoology, no. 413.) Smithsonian Institution Press. Washington, 1986. p. 66. Stewart, Paul: Galapagos: The Islands That Changed The World. Yale University Press. New Haven, . p. 80. Eik, Kanny & Akre-Aas, Oddveig: Ein heim vart til i 1802. Eik. S.l., 1987. ss. 61‒61. Hoff, S. Drømmen om Galapagos: En ukjent norsk utvandrerhistorie. Grøndahl & Søn. Oslo, 1985. Though not a historian or history buff, I loved reading about Niclolai. Sometimes the side characters are more interesting and baffling than the lead ones, and Niclolai was no exception. What an interesting story and awesome writing of events. I couldn't put it down while reading. thanks for sharing this! Fantastic post. Just want to point out a minor typo. It isn't "Asilo del Paz" but "Asilo de la Paz". Corrected. Thank you for letting me know! Thank you for translating the story and sharing it. I enjoyed it very much. This was a wonderful read, and I've been recommending it to my friends. I noted a series of corrections (typos) and wondered if you'd like me to email 'em your way. Innlegget ditt er blitt en pocket hit - sammen med en kolleksjon av andre innlegg fra Politico, Medium, Washington Post og Wired. :) Gratulerer. Helt konge. This gives great perspective that all our lives can have an impact far greater than we realize. So beautifully written and fascinating. I could not stop from start to finish. Thank you for this inspiration! This was a fascinating read! The detective work involved is absolutely incredible. Nicolai's story is so intriguing - it could be a book! Fantastisk historie.Fant artikkelen via PocketHits.